Yesterday I didn’t know what to cook. I wanted to make something that was (a bit) healthy and easy to prepare. I also had some leftovers, so it would be nice to use them. I decided to make bruschettas. It’s a starter or an appetizer, I know. That’s why I served it with a little salad. I invited Mister Mous_tache to try my new bruschettas and to vote for the best bruschetta of the evening. We would elect a Miss Bruschetta. 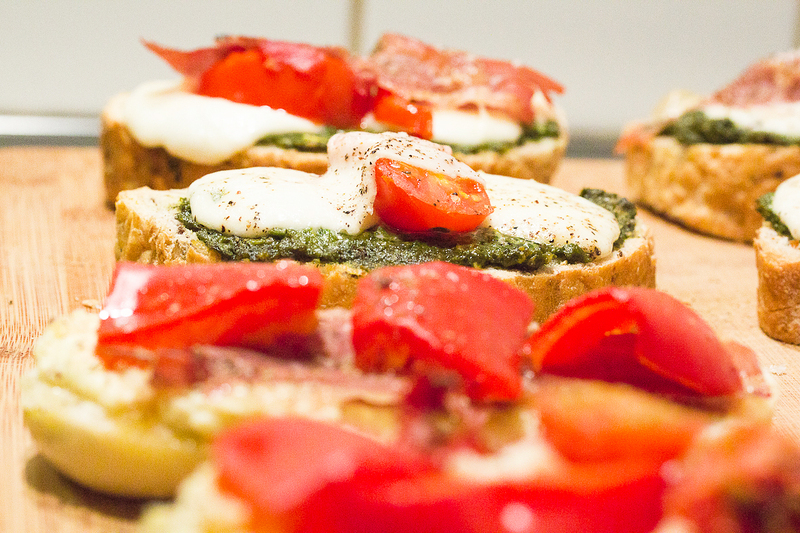 Four bruschettas were made by yours truly, Hot Cuisine de Pierre. 1. Mozzarella, sun dried tomatoes, Parma ham, green pesto. 2. Mozzarella, cherry tomatoes, green pesto. 3. Boursin Goat cheese, Parma ham, sweet red pepper. 4. Boursin Goat cheese, sweet red pepper, sun dried tomatoes, cherry tomatoes. Mister Mous_tache and I, we clearly both had the same opinion. Number 1 and 3 were the best of the four. So, here are the recipes of 1 and 3. 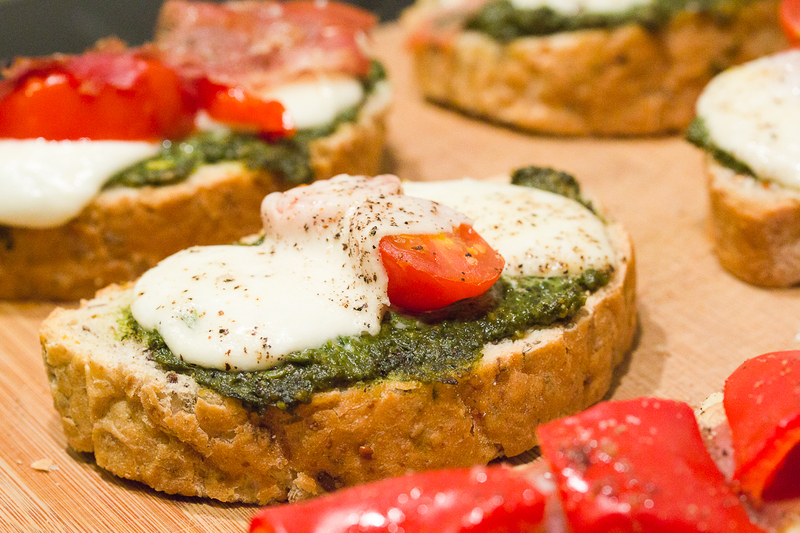 If you need a pesto recipe, just have a look on my blog (Pesto: link). What do you need? Nr. 1: mozzarella, some sun dried tomatoes, some slices of Parma ham, a couple of teaspoons of green pesto and some slices of bread, pepper and salt. Nr. 3: some slices of bread, half a sweet red pepper, a slice of Parma ham and Boursin Goat cheese, pepper and salt. Preheat your oven on 175°C. Take the slices of bread. 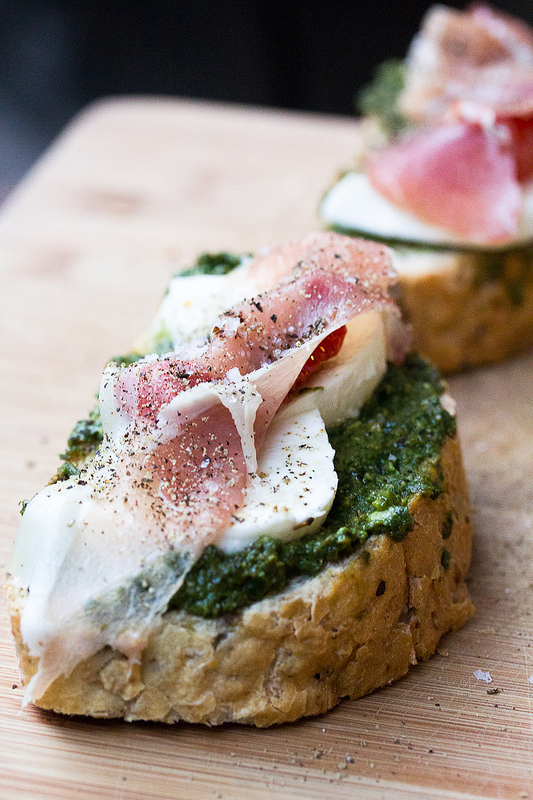 Put some green pesto on your bread. Slice the mozzarella and place it on the bread. Finish with some sun dried tomatoes, a slice of Parma ham and freshly grounded pepper and sea salt. If you want to make number 3, take another slice of bread. Add the Boursin Goat cheese. Cut the sweet red pepper and add on the bruschetta. Finish with the Parma Ham and pepper and salt. Place everything on a cooking sheet and place it in the oven for about 5-8 minutes. Good luck!